Imagine a range of “red letter day-type experiences” tailored to meet the specific needs of dementia clients? Imagine if people could buy a “grand day out” for a person diagnosed with dementia? Imagine if the “Grand Day Out” rekindled a passion and love for a hobby or pastime that they used to enjoy? 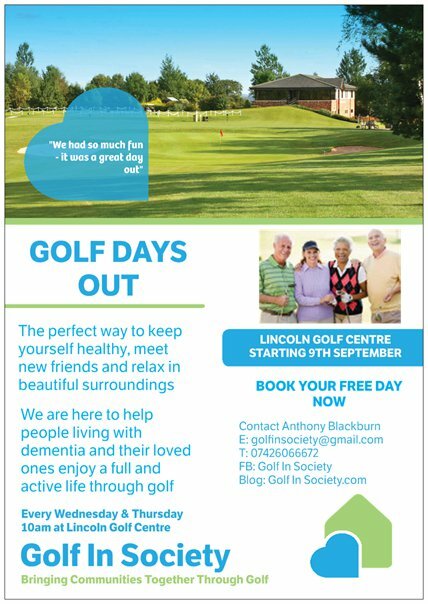 Such a service is currently being piloted at Lincoln Golf Centre and has already “touched” the lives of many. It’s being supported by some amazing people who want to help families living with dementia. Their desire and passion to help often comes from personal experience of dealing with this devastating disease. It’s inspirational to witness how much they want to be involved and make a difference. It restores your faith in humanity!!! In the coming weeks we’ll share with you the emotional and inspirational stories of how golfers are making a difference to people’s lives through the game they love.